In my last post I said I was going to do a giveaway next right? So sorry guys. I just got caught up doing other things on the weekend but I promise to have that post up soon. So aside from errands and such I finally cleared off my cutting table. Unfortunately instead of it being a place where book projects are created it became the dumping ground for mail, magazines, etc. Veens mentioned to me recently that I hadn’t posted any pictures of bookbinding projects and actually that’s because I’ve been pretty much taking a break from my bookbinding this year. What with the health issues I had earlier in the year and things I just needed a break. But, I’m happy to say I’m gearing up for the studio tour I’m participating in during November so no more excuses. 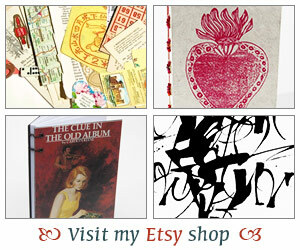 Plus, along with my Etsy shop I just opened up a shop on Artfire. I’m so excited. So, I cleared off my table and started working on shop stuff. 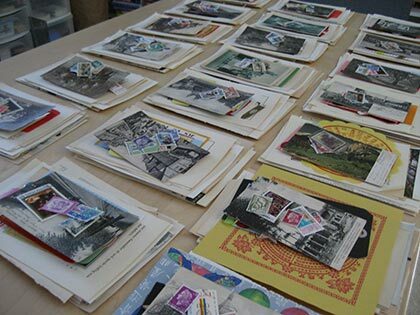 Here is a picture of the art packs I put together with new and vintage ephemera. The bookbinding begins later this week. Enough with the shop talk though guess where we went this weekend? To Borders. A two-story one that we just discovered. It’s a bit far from our home so we probably won’t go there often but it was nice although a bit too crowded for my tastes. We could barely find a place to sit. I did walk out with a couple of books though. I got The Angel’s Game by Carlos Ruiz Zafón. I know reactions to this one have been mixed but I still want to read it. Then I also found The House at Midnight by Lucie Whitehouse which sounds like it could be a good selection for the R.I.P. Challenge (plus it was a bargain buy) and Tethered by Amy MacKinnon (another bargain buy). All in all, a great weekend. I hope yours was a good one too! Loooove the old stamps. I’m going to do a post tomorrow you might like, since you like bookish art. I had a great weekend, and today I was utterly and completely lazy. It was fabulous. Plus, I got to read two whole books. I haven’t gotten to do that in a while, so it was great. Can’t wait to hear more about your projects, Iliana! Speaking of Borders, I find that the variety in our local one is not as much as Books Kinokuniya, and although I love their 2-in-1 promotions and other discounts at times, I don’t go there often due to the distance. Being a bookbinder I think I shall call back next week and see how your boobinding is going. I can’t wait to see all the goodies you create in the next month or two! I rarely ever go to Borders, but I really should, as that became my last name when I married earlier this year! Ooh I have the Angel Game and The House at Midnight. Can’t wait to read them too. Your journals are so lovely Iliana. I love the beaded ones. I think I am going to send my sweetie a link to these for a Christmas hint! jenn – I can’t wait to see what bookish fun you’ll be talking about! I love all kinds of vintage maps/stamps/etc. There’s so much you can do with those. Isn’t Etsy great? I can spend hours on there! haha..
veens – I still did some crafty stuff but I was sort of on a break for the most part. I’m excited about getting back to bookbinding though. I have missed it a lot. Joanna – I know how books can linger on the shelves. Oh dear, we need lots more hours to read right?! Richard N. – Well, I can say I work pretty slowly but that’s ok. I enjoy it and I like to take my time. I wish I could do a lot more books and I miss taking classes. I used to belong to a great craft guild in Dallas and learned so much. Love the photo of your table with all the goodies on it! Are you selling vintage ephemera now? I wish I had more time to do collage, but unfortunately I don’ t have enough hours in the day! I read Lucie Whitehouse’s new book recently and liked it–I have this book as well to read at some point. good luck with the tour and your new Artfire Shop! There’s a two floor Barnes and Nobles near me, it’s fantastic.